Des tells Mike his life is the grave with Daphne. Mike asks what Daphne would say if she knew her son would be left without a father because he didn't have what it took to get on with his life. Charlene, Scott and Henry are thrilled to see their letter in the ‘Dear Georgette' column. ‘Georgette' has given ‘them' advice to leave the relationship. Charlene thinks Lou sounds like a catch and thinks a bit of his own medicine will be good for Harold. Des arrives home and takes Jamie from Madge. He tells Jamie he's sorry and says everything will be all right as they have each other. He tells him how much he loved Daphne and says he doesn't know how he will let go of her. DES: We'll make your Mummy so proud of us. 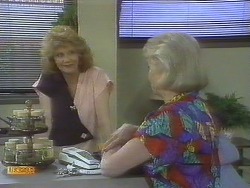 Helen arrives and tells Madge she is upset about what happened with she and Des yesterday. Madge tells her she thinks Des has made a breakthrough with Jamie. Helen says she'll tell Eileen the good news later. Des emerges from the bedroom and apologises to Helen for shouting at her. 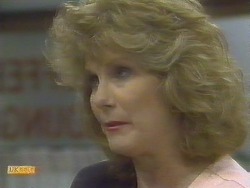 Des agrees that Daphne's clothes should go to charity and asks Helen to sort it out for him. Madge thanks Harold for giving her time to sort herself out. She asks him to dinner and says they can have a serious talk. He asks if she will give him a decision but she says the decision may be his and after she's told him what she has to he may not want to marry her. Mrs Mangel is anxious, as her case has been delayed. She asks her lawyer to be honest with her about her chances. He tells her she'll probably have to sell the house. 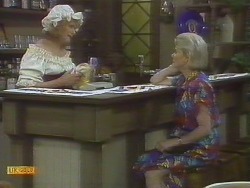 Mrs Mangel hands Jane the letter and tells her to give it to Len. Madge is reading the paper and Henry and Scott are worried that she will find the letter. They take the paper and make a run for it. 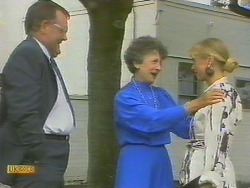 Helen arrives and Madge tells her she has asked Harold to dinner tonight. She has decided not to see Lou again. Harold joins Mrs Mangel at the courthouse and she tells him that she has a very good feeling that she will get an out of court settlement. Jane returns and tells Mrs Mangel that when she handed over the letter Len went pale and then looked angry and then said Mrs Mangel can keep the house. They are all overjoyed and Mrs Mangel pecks Harold on the cheek as she gets lost in the moment! Jane and Harold want to know what was in the letter. Mrs Mangel says it was merely food for thought. Mrs Mangel: I just drew his attention to a simple truth. If the house were sold I'd have to find somewhere else to live, somewhere where property values aren't as a high. Such as Queensland for example where incidentally Len and his fancy woman have made their home. I only pointed out there was every possibility that I might end up living down the road from him and since I don't have any friends there I'd have plenty of time on my hands to make his life unpleasant. Harold: My word isn't that rather like blackmail? Harold is sorry but he can't stay for dinner as he has a date with Madge. Mrs Mangel doesn't know why he is giving her the time of day. Dinner preparations are under way and Charlene thinks Madge should think carefully before taking Harold back. Henry thinks Lou sounds like a cad and thinks Madge should stick with Harold. Madge tells them to make themselves scarce after dinner. Mike comes to see Jane. She says she can't see him tonight as she's practicing for the dance competition with Tony. 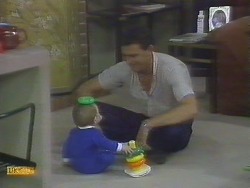 Des is playing with Jamie. Mike returns and is pleased to hear that Des is going back to work. Des thanks Mike for talking sense into him and tells him he understands that Daphne's death was hard for him too. Mike says he is going to miss Daphne like hell. 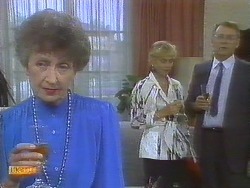 Charlene, Scott and Henry make themselves scarce and Madge decides to tell Harold what happened in Brisbane. She tells him she went out with another man and not just once, quite a few times. She says she didn't mean it to happen but things started to get serious. 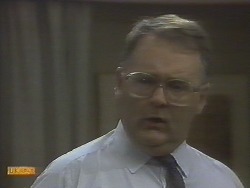 Harold is gobsmaked and tells Madge he is appalled she went out with a total stranger. Madge says he's not a stranger – Harold knows him. They are interrupted by a knock at the door. Madge answers it and finds Lou standing there.